The incident dates back to June of 1999 and took place at an office Polis had in Boulder for a company called JPS International LLC. Polis told the officers who arrived at the business that a woman he was employing, Patricia Hughes, had given her resignation a few days earlier, but called him on the day in question saying she had information to "go after" him if her exit from the company did not go smoothly. Polis—at the time still legally named Jared Polis Schutz—told Hughes not to take any sensitive documents, and quickly drove to the office. "After hanging up with the dispatcher, Ms. Hughes attempted to leave the office. Mr. Schutz physically blocked the door to prevent her from leaving. She moved toward him again, this time hitting him with one of her bags. Mr. Schutz then put both of his hands on her shoulders and pushed her back to prevent her from leaving," according to the report filed by the officer who interviewed Polis. Polis's account of the extent of the physical contact differs from what Hughes told a different officer who interviewed her. "Hughes then tried to leave and Schutz did not let her leave. Hughes said that he grabbed her and pushed her back into the office. Hughes said that when Schutz pushed her she was pushed back into a file cabinet, hurting her leg. Hughes said that she then said that she was going to call 911 and went to the phone. Hughes said that she tried calling 911 three times and twice Schutz hung the phone up. The third time Hughes got through," according to Hughes's interview with police. The officer who interviewed Polis made other notes about Hughes's appearance, as it related to the confrontation. "I did observe two bruise marks on Ms. Hughes left inside bicep and a red welt on her thigh. She stated that the bruises on her arms were from Mr. Schutz ‘grabbing' her with his right hand. The bruises were not conducive with Mr. Schutz's statement that he pushed her shoulders. Nor were they conducive with Ms. Hughes's statement of Mr. Schutz standing in front of her and grabbing her." "The welt on her thigh she said was from Mr. Schutz pushing her back when she attempted to leave. The welt was conducive with the a (sic) file cabinet in front of the door. There was also a key protruding from the upper right hand corner of the cabinet that could have produced the welt." The officer who interviewed Polis wrote in the report that Ms. Hughes "did knowingly and unlawfully take several files with original contracts and other sensitive documents" from the business. Other court documents show that Hughes sought and was granted a temporary restraining order against Polis two days after the incident. About three weeks later, the order was vacated. Hughes remarried, and died in August of 2014. 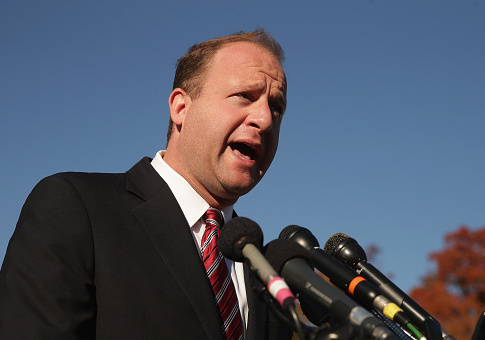 Polis is serving out the remainder of his fifth term as representative to Colorado's 2nd Congressional District. He won the Democratic nomination for governor in late June of this year, defeating a field of rivals which included a former state treasurer, former state senator, and a current lieutenant governor. At the time, he had invested roughly $11 million of his own money in his campaign. He has long been listed as one of the ten-richest members of Congress, thanks mainly to early entrepreneurial internet endeavors which he sold for millions of dollars. About one year after the incident described, he also legally changed his name from Jared Polis Schutz to Jared Schutz Polis. Numerous media accounts reported Polis was motivated to make the change to honor his mother's maiden name. He faces Republican State Treasurer Walker Stapleton in the November general election. The Polis campaign did not respond to requests for comment from the Washington Free Beacon.